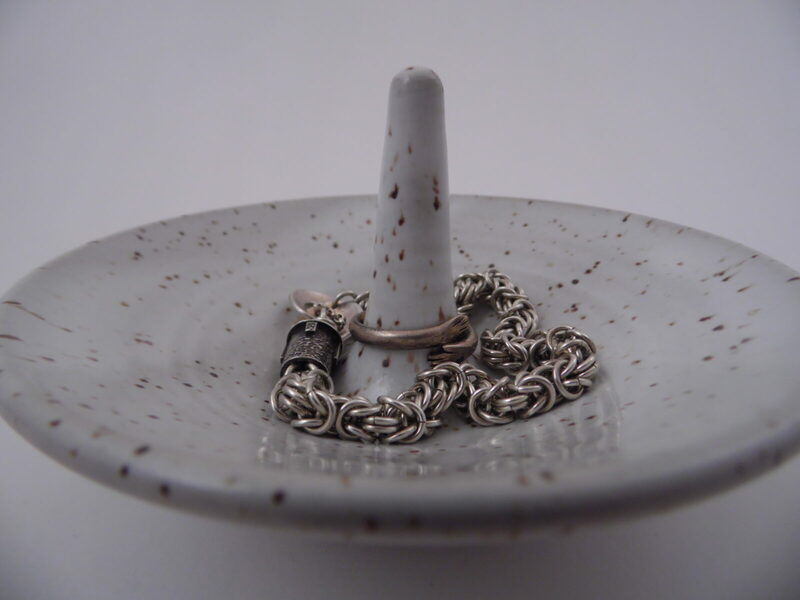 This ring holder is hand-thrown on the pottery wheel and glazed in a speckled white. 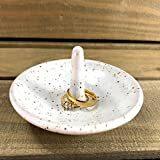 This ceramic ring dish is a perfect place to hold your rings in the evening. Leave it by the sink to collect your rings as you wash your hands or put it on the nightstand to place your rings as you get ready for bed. This jewelry dish will only take up a small amount of space on your dresser since it is only 3 inches wide. It will hold many rings, though, since multiple rings will fit on the vertical column. It is a functional piece and is dishwasher and microwave safe. Jewelry pictured is for demonstration purposes only and doesn’t come with the pottery. If you are interested in other ring holders by JaysClay in different designs and colors, such as purple, pink, blue, and green, type JaysClay into the Amazon search bar and you will see the other items available.